Hebe ‘Andersonii’ forms a much-branched, bushy, evergreen shrub, about 6–9 ft (2–3 m) high. The leaves are mid to dark green, lance-shaped, about 4 in (10 mm) long. In June–July it bears 4 in (10 mm) spikes of light purple flowers, which fade to white, tender in the UK. Hebe ‘Midsummer Beauty’ is similar and more hardy. 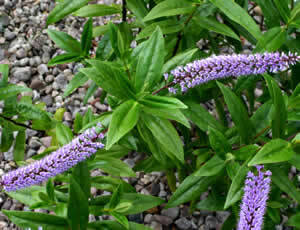 This was the first hebe cultivar, raised in 1848; the parents were said to be Hebe salicifolia and Hebe speciosa. But Graham Hutchins says that seedlings from Hebe ‘Andersonii’ resemble neither of the above.